Psssst - we’re going on slow rolls every Saturday in April. You should come with us. Check it out here. Organic grains, naturally leavened bread, & simple pastries. Brake Bread is a St. Paul bakery committed to serving our neighbors and building community through sustainable practices, time honored baking techniques, and the occasional free cookie. Brake Bread is a neighborhood bakery where folks come in for fresh baked goods and a cup of locally roasted coffee. Take it to go or perch by the window. And yes, the wi-fi is (gluten) free. 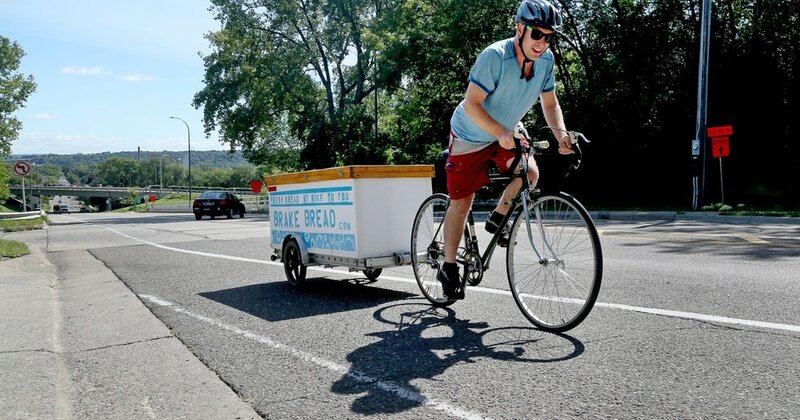 Brake Bread started in 2014 as a Community Supported Bakery (CSB) delivering fresh bread, by bike, directly to homes. We continue to do this and now have an even larger delivery radius and pickup locations to serve you. You can become part of our Community Supported Bakery by signing up for regular deliveries to your home or a pickup location near you. Subscribers are at the core of what we do and each week we load up our bikes and trailers to bring you the best we have to offer as well as great items made by other local artisans. You get to be part of a sustainable food system! Wait for that bike to show up! Home delivery is $1.25 per delivery. Pick-up locations = no delivery fee. Yup! Each week you can enjoy what we've selected for you or log in to your account to switch things up. Add some pastries, coffee, honey or jam, put your account on hold for while you're out of town or make any payment changes. Once you set up an account, you’re in charge. Which Delivery Zone Am I In? Use this map to see which delivery zone you are in. We deliver on bikes year round! That’s our schtick and we’re schticking to it. Sometimes, snow and ice slow us down. But so far it has worked. If we get a day where the weather would put our delivery bikers in a dangerous situation we may up the carbon footprint. But till then? All bikes all the time. If your delivery day coincides with a major holiday, such as Nate's birthday, we will let you know of any schedule changes. If we screw up your order let us know. We’ll make it right or refund your money. If you need to cancel your subscription we will refund any money remaining in your account. We require two days prior notice of your delivery. Bread is delivered weekly on your delivery day between noon and 4 pm. The default delivery location is to hang the bread on your front door. On your delivery day please hang a bag on your door by noon. If no bag is available we will leave it in a recyclable or compostable bag that you can reuse in future weeks. A handful of folks have had squirrel problems. If this happens we suggest a container such as a small rubber maid bin. Pick Up site delivery times are listed when you choose your pickup site. This is generally 3pm- location closes, BUT always check the specific site for details. Your name will be on the pickup list at the site. Please check off your name when picking up your bread. Some weeks, we have multiple bread options. Please check that you are picking up the correct bread. Bread is available until the close of your pickup site. (varies by site, check with us or the site for times). After the pickup site closes for the day the bread is donated. Organic grain and the natural leavening process makes us proud to say that we are making the healthiest and most flavorful bread in St. Paul. Our flour is milled from certified organic grains. All of that is milled in MN and each loaf starts with wheat grown within 2 hours of the bakery. When you buy bread from us, you’re supporting Minnesota farmers, millers and bakers. Thanks for being a part of sustainable food systems! At Brake Bread, our focus is on crafting naturally leavened (aka sourdough) breads. Each batch begins with a handful of wild yeast starter and ends 36 hours later in a beautiful loaf pulled from our stone deck oven. Why wild yeast? Flavor, digestion, and health. Naturally leavened bread provides easier gluten digestion, access to more vitamins and minerals, and has a lower glycemic index for an even release of energy. But mostly we do it ‘cause it tastes better. Baker's Choice - You'll see. We source the best ingredients we can find from sources we trust. Combining those ingredients with attention to craft, we create unique pastries that you may not find anywhere else in town. From Scandinavian inspired Cardamom Spinner to traditional Chocolate Croissants, you're sure to find something that will satiate your sweet cravings. We keep it simple with hot and cold coffee from St. Paul's own Bootstrap Coffee Roasters, hot and iced tea from Numi, and cold cans of LaCroix. Located on the burgeoning W. 7th corridor, Brake Bread is St. Paul's go to bakery for naturally leavened breads and simple pastries. At Brake Bread we believe that good things take time. This is as true with bread as it is with community. Brake Bread is a neighborhood bakery located in the West End of St. Paul. We began in 2014 as a Community Supported Bakery, baking bread and delivering it by bike. We continue to do this in addition to having our bricks and mortar store at 1174 7th St. where we sell a full selection of our naturally leavened bread, pastries, and cookies. We are small. We know our customers. We love our neighborhood.